We’d love your help. Let us know what’s wrong with this preview of More than a Moment by Kristin Albright. Lucas Mercado, the son of a Mexican migrant worker, has been Now Available! To ask other readers questions about More than a Moment, please sign up. More than a Moment is a refreshing YA read. I was immediately drawn in by the author's intelligent and emotional writing. The reader immediately feels connected to the heroine, Julia. She's been dealt a tough hand when the book starts and you feel her pain and frustration, which took me back to my own teenage years. One of the aspects I found most appealing about this book was how relevant it was. 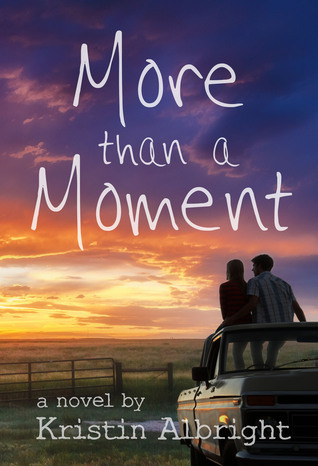 There were so many moments where Julia and Lucas are having to deal with things and I just want to j More than a Moment is a refreshing YA read. I was immediately drawn in by the author's intelligent and emotional writing. The reader immediately feels connected to the heroine, Julia. She's been dealt a tough hand when the book starts and you feel her pain and frustration, which took me back to my own teenage years. One of the aspects I found most appealing about this book was how relevant it was. There were so many moments where Julia and Lucas are having to deal with things and I just want to jump into the book and take care of them. I winced more than once when they were being teased (I will not go into details to spoil it). I didn't want to believe other people would treat people that way and I thought to myself, "This would never happen! ", but then I realized it would and it does. It made me stop and think about being a teenager myself and seeing others treated poorly, knowing I should step in and say something, but was too afraid for fear of being ostracized. Teenagers have a hard enough life just trying to fit in and it's hard to do anything to jeopardize that. This book will make young people stop and think, "What would I do in a situation like this?" or "What should I do?" Hopefully it has given some the courage to stand up for others, even when they're in the minority. The characters were great. I loved Julia. She was very relatable and a strong girl...a great influence to readers because she did what she knew was right, not what was cool. Lucas was lovable and kind. Such a sweet guy. It was very easy to hate Tyler and Miranda. They were the worst aspects of teenage life that unfortunately, we've all had to deal with. While visiting her horse named Almost at the Perkins' dairy farm, she meets Lucas Mercado, who is taking care of Almost for the summer while she is recovering. Julia finds herself intrigued by him, as he helps her to start riding again and eventually with Lucas' encouragement, Julia feels ready to compete again. After returning to school, Julia finds things have changed among her friends, she finds herself resenting them, while developing a crush on Lucas. But Julia's not sure she should jump into a new relationship so fast after having just been dumped, but their chemistry is undeniable. However as they grow closer, everyone in town seems to pick on her about it, so much so that Julia is ostracized for having associated with Lucas. Kristin is a native Wisconsinite and a proud alum of the UW-Milwaukee Peck School of the Arts. Her favorite genre to read and write is YA fiction - which is probably a side effect of being a camp counselor. When not in writer mode, Kristin enjoys hiking and cycling with her family and photographing weddings with her husband.